Your professional advisor is your guide in helping you create an academic plan that works specifically for you. Here is some helpful information to get you started on your journey to success. 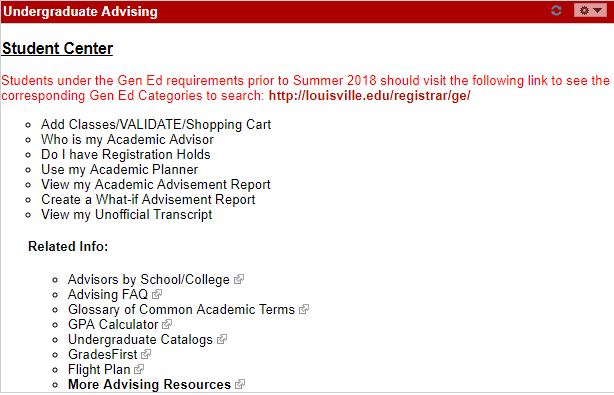 Meet with your academic advisor to discuss your interests, values, and what you are most excited about in terms of your education here at UofL. They will help you define your academic goals and long-term objectives, while considering what is happening in your life now that may impact your journey. This list of UofL majors includes a major description, department website, and related skills and potential careers for that major. You can use this as a starting point to narrow down your top majors for further research. Please note that degree requirements change, so always check your Undergraduate Catalog or with your advisor to get the latest requirements. The Career Development Center provides comprehensive career services for all students and educates Cardinals through the exploration of career interests, values, and skills. The Undergraduate Catalog lists all of the courses/class requirements for each major and provides examples of Four-year plans. It also lists policies and procedures for the University. The ULink Student Center can be used to create an academic plan, view registration holds, and review your unofficial Academic Advisement Report. If available, you and your advisor can utilize Flight Planner to interactively plan out your remaining coursework.